These are my flowers in November! I'm working on getting Stan's column up, now that my migraine is gone. I also am trying to get all of ifish.net's news columns up so that we can begin gathering gifts for the children in the hospital at Emanuel. You know, for our Christmas Party. A wonderful member donated his time to write to sponsors to try to gather gifts. He has been asked for news articles and a letter head. Coming right up! It's high time I scanned some of these articles, anyhow. But, phew, what a lot of work! I finally got some of them finished! They are below. If you'd like to donate gifts for the children in the hospital at Christmas time, please contact us! I think it's just awesome that people find it a worthy cause to volunteer for! I can't wait! I really, really can't! I live for this event! Let's rally our efforts and really make this a great Christmas for children that otherwise live with challenges far greater than they should have to worry about. OK. Stan's column is up! Oh! Did you watch PBS last night? It was on Malawi and Zambia, and retraced the journeys of Dr. David Livingstone's discovery of Lake Malawi and Victoria Falls. It was just awesome! Consider all the worlds Thy Hands have made!" kept going through my head and now, this morning, it repeats, over and over in my head! Now, I simply must go to Africa! I want to canoe down the river like they did and then swim on the edge of it! Way, way cool! I've been looking it up on the internet and came up with this! Watch! Click on the movie! It makes me giggle! Life is so awesome and I want to live it! I woke up feeling good, today. Can you tell? When I wake up feeling good, I have to remember to hold myself back a bit, because if I don't, I spend a week paying for it! But... something like this! This would be worth a week of pain! From Virgin Media : “Life on the edge swim; ... a small jump (what felt like the leap of death) lands you in a small rock pool at the edge of the Falls. As you stand this close to such raw, natural beauty, you can barely hear yourself screaming above the sound of the water rushing down while adrenalin pumps through your body turning it into a shaking, excitable mess. You realize why the not-eating-before-swimming rule has always stuck". The Falls fall so far! It is one of the world's natural wonders! And yet, I live in one of the most beautiful places in the world! What a fantasy land we live in! What a playground! Far and near! You can read more about Dr. David Livingstone, here. I sure am! I may look forward to Heaven... I may not be afraid, but while I'm here on earth, I appreciate every living moment that I feel good. When I don't feel good, I'm more apt to dream about Heaven, but when I feel good, I'm really glad to be right here on this wonderful playground called earth! I always feel happy, though, the first of the month, when I see how long I have lived since my dissection! I get to add yet another month! Ticking them off is a rush! This is my new kitty! His Mom was killed when he was 2 weeks old. So, Andrew and Mom to the rescue! He is so cute! He slept on Andrew's face last night. He has the most awesome purr motor! Rev is extremely and overly intrigued. Kilchis just rolls his eyes. I don't think Molly is ever going to speak with me, again. Andrew is so worried about Molly that he made me tell Molly it wasn't his idea. I have to go to Portland. I'm trying to get my bazillion doctor appointments over before the winter conditions hit the road. This will be a challenge! I'm going to Palm Springs for the first time to see my Dad's house on the 10-15th. It's just he and I, this time! We are going to have fun, together! One of the days I want to go to a spa. I've never been, really. If it's not too expensive, I'm going to try it! So funny, Dad has someone living near him in his community that tells Dad that he knows me better than my own Dad does, through ifish! He's been a member before my Dad even knew him and he's from Canada. I will get to meet him! Fun! My Dad hears from people all over that know ifish and they always say, "THAT is your daughter?" Tee hee... It makes my Dad smile. I have to get kitty to the vet for her shots and then head off to Portland. I worked so hard to get things done so that I could get to my surgeon to check on my cornea. He did such great work on me! I can't wait to see what the trees have done, since the rain. I so hope that the leaves aren't blown down yet! Oh, and you watch! Fishing will pick up while I'm down South! What do you bet? Argh. The other day I was out canoeing and Bill came out to fish. I asked him to get in so that I could show him the fish. I rowed him over to the hot spot and pointed them out. "There went one! And another! And another! Bill! Look!" But, he couldn't see them! It may have been my sunglasses that helped me to see them, but it was the weirdest (and most wonderful!) feeling to be able to sight something that someone else with good eyes, couldn't see! Maybe I can duck hunt after all? Wheeee! I went to the eye doctor yesterday, and he was tickled pink. My implanted cornea is doing well. I still have to keep up the drops to help it from rejecting, but for now, it's good! He told me how gratifying it is, to have me seeing! Things have been right on schedule and going altogether too smoothly. I should have known! It was a week from when I was going to Palm Springs to go visit with my Dad. Day before yesterday, while in Portland, I got a phone call from my sister. That's never a good thing to hear. Instantly, I went on alert. My brother had been calling me all day, and I had missed him. Now I knew why. Something was up. My Dad is 83, and spends his days in Palm Springs marshalling so that he can golf without high green fees. Turns out that two days ago, he had a serious golf cart accident and is in the hospital for some time. He was (get this!) trying to push start a golf cart! "DAD!" It doesn't surprise any of us kids. My Dad is eternally youthful. "The young kids do it all the time!" he argued. Anyhow, while doing it, a cart in front of him stopped and it catapulted him forward, hitting the accelerator. One leg was dangling outside the cart, as it sped along over sharp obstacles. Oh, Dad! He has cuts, clear to the bone and his hip and ankle are injured. With the change in plans, I didn't know if I was going to go early to Palm Springs, or postpone my trip, altogether. I was scheduled to leave on Monday. Carol, a family friend (and a special friend of my Fathers ) is going down to care for him also, and I didn't know if two people might be one too many. But, yesterday Dad called me, and asked when I was coming. I'm just so sad for him. He had been having more fun golfing and being in the place he loves, there. Now, he'll be laid up for some time, they say. Poor Dad! I was so looking forward to doing things out of doors with him. When he was in Canby, we tried to fish together this Fall, but he came down with a cold and had to cancel. Then, fishing was so bad that we just never did get to go. Life changes every day and we have no control over many of them. Don't wait. Go see the ones you love, or at least call them. I'm trying to catch up on things I need to do so that I can decide when I can leave. I was hoping to go to the Rendezvous dinner, this Thursday. It is also the media opening for the new Filson store and I wanted to go to that, too! So many things to do! So many people I love! Can't we please add a couple days to the week, or at least, a couple hours to the day? As an afterthought, I wonder if I should be speaking so frankly about my Dad. There is a gentleman from Canada who snowbirds in my Dad's community in the winter. He tells my Dad that he knows "Jennie" and my family better than even my Dad does, from reading this column. He has been reading ifish since before he met my Dad and is looking forward to our meeting, in person. Ya know.... I better watch what I say! But, Dad!? Push starting a golf cart?! At 83?!? Wow. The river really came up, last night! It's full of leaves and very full of slightly muddy water! Poor folks fishing the Rendezvous! Or-- maybe it's good out there? Who knows! If so, it's high time! Thanks to Shana for all the work she does on this tournament! We are going to the dinner, tonight. I feel guilty about that! It's like skimming the cream off the top! We SO used to get in trouble for that, back in the days when cream came on the top of a gallon of milk! Wow! Remember that? I just spent a bit googling to find a picture of the fat gallon jugs of milk we used to get, that came with cream on the top and couldn't find one! Does anyone remember that? Found one! This is how we got milk, and the whole top was covered in cream which my uncle used to pour on his waffles. ICK! My Dad called and asked me to postpone my trip to Palm Springs. So, now, off to Alaska Air to see how that's done. I used miles accumulated from credit card points. I wonder if I can do this? I'm really worried about him, though. I wish I could just go, but I do understand that it wouldn't be any fun, just sitting around the rehab center. He's doing better, I guess. It's his ankle that is the problem. He sprained it badly so many times as a college basketball player, and now it's really messed up! At least his hip is alright! Yay to that! I may go out and swirl some eggs around in the water, but I have a feeling that the leaves are so thick that the salmon couldn't find my offering. It's raining so hard that my dogs will probably protest! They are spoiled rotten! My kitty is so wonderful! He is so friendly and playful! Being bottle fed really socialized him to humans and he is so friendly and curious! He certainly knows how to put Rev in her place! She spits and claws at him! Makes me laugh to see such a tiny creature defend himself! The leaves are just about all blown off the trees, here. Funny, but I still have raspberries on the vine! I'm so excited for Christmas decorations. May I start yet? Oh! I woke up this morning, late, to the sound of the shuttle guy, Bob, downstairs talking to Bill in the kitchen! I wish I would have gotten up earlier! I would have liked to have met him! See, I have this pretty black velvet place mat that goes under our new coffee pot and red beads and Christmas bulbs would look so nice, there! Maybe some holly, too! I am stressed, today. Trying to get ready and packed to leave for Palm Springs. The river is heavy and full, and a touch dirty. I hope to fish a little, but it's not looking great! So, imagine this... I'll be gone for 7 days and no fishing! Just when the river might be full of salmon! Oh well. Sunshine sounds nice, too! Off I go! Packing... Whatever shall I wear? Sgt. Pepper is a pig! I have never seen a kitten eat so much! And, won't eat it's kitten food, but instead, begs until it gets some expensive treat food I got for Molly! Gee whiz! Must be nice! It's no wonder Molly doesn't care for him! I'd spit at that, too! I've been working hard, trying to get the Christmas Party o'[;lgttttttttt (Um, the preceding was called "Kitten on the keyboard." We have lots of elves! STGRule is collecting paypal donations and does a great job of playing Santa, shopping for the kids! Pete is gathering volunteers for the transport and toy counting committee. Bill Monroe is printing it in the paper. I am trying to get the word out, here. Thing is, Sally at the hospital called Pete yesterday and she wanted to know if indeed we were still doing ours. I guess with the economy so bad, that folks are having a hard time, keeping their commitment to the kids. So, let's make up for it! OK? Click here if you'd like to know more about our party! I just updated the toy list! Our Christmas Party has so many purposes! If you attend, it's your chance to meet the people behind all of those silly monikers on the board! When you arrive, you are met by the greeting committee. Here you can buy an ifish hat or decal, if you like. A portion of all sales go to the kids. People are in the highest spirits, as the place is all decorated and it's just plain good fun to bring presents! I find that I just get so much more out of giving, than receiving! It just feels so good! It's the remedy for everything! I'm not kidding. If you are ill, it will make you well! Or, at least well-er! I love that word! It's a stormy day, today. The wind is blowing and the rain is coming down. I sure wish I could decorate! Is it time... yet? I'm leaving for Palm Springs on Tuesday. I'll be there for a little under a week. I hope to wheel my Dad around outside and help him to not be bored! I'll have to get the winners. It was tough fishing, for sure! I was amazed that they fished out as many as they did! I'm off to Palm Springs to help my Dad recover from his accident. I hope to wheel him around outside and have some fun. I bet it's incredibly boring, there and he is used to being very active. Thank God for Bill, who is driving me to the airport. I really, really don't want to go! I will pray that the rivers don't flood and that you all get into some fish! Love you all... my dear ifish family! I treasure each and every one of you! I have such a huge and wonderful family, here! I'm lucky! Thanks and huge hugs to STGRule, Pete, JustCallMeDave, and all the wonderful moderators who are taking over in my place! I'll try to login and update, while I'm in sunny Palm Springs! Off to church, this morning. What a great time it is, down here! My 83 year old Dad is keeping me so busy that I don't know how he does it. Each time I hit my bed, or get near it, I'm drawn to it and don't get up till the next time he calls with another great thing to do! This morning it was church, and breakfast afterwards at the famous Sherman's Bakery and Deli. I know, I know... I didn't want to come, but now I don't want to leave, and tomorrow is my day to fly home! I figure now that I could do quite well, living like my Dad. He lives in the neatest neighborhood with the most awesome crew of people! You can't walk but 5 feet before you need to stop and visit with Chris, Ian, Wes, Cindy, Bobby, Myrna, Les, or Marge. :) I know them all, now! Anyhow, I'm so sorry that the weather station pooped out. I'll have to wait to get home to try and fix it. Things like that bother me so much! But, I couldn't coach anyone through it! Well, I better be off. I have to rest up for the next round of whatever Dad wants to do, while I'm here. HOME! Home to my Kilchis! Home to my family! Home to my river! Funny, no matter where I am, it's where I want to be! The flight home was so beautiful. That is, until I fell asleep. I was so exhausted that I slept through the landing, even! My Dad just wears me out! I think we are done playing for the night, (after he takes me to dinner and then for a drink, and then to look at some beautiful something or another...) but, no! We aren't finished yet! It's off to another beautiful place! What spirit he has! What joy! He sure gets a kick out of life! It's catching, too! You can't help but have fun with him around! I really love it in Palm Springs. I think I could easily live there! I think... I mean, the sunshine! It's beautiful! But, would I get tired of the sunshine? I don't know! It sure is nice! 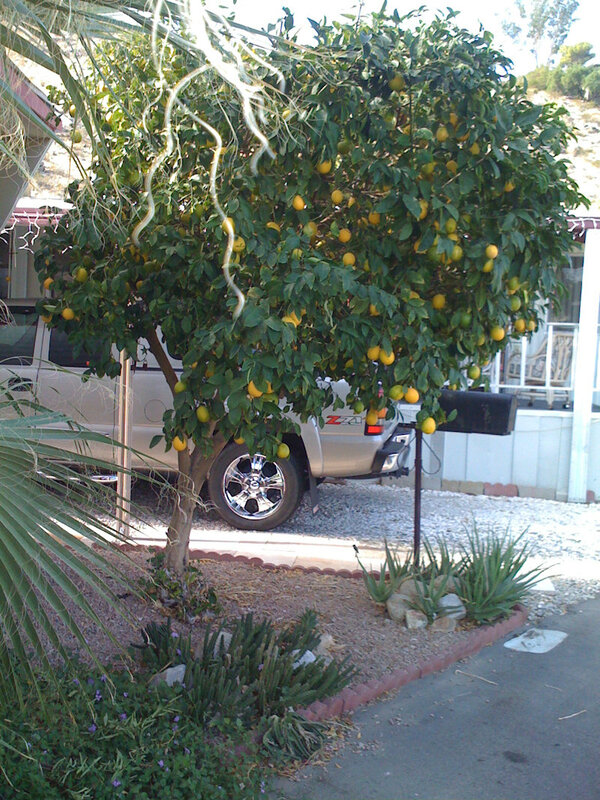 I was especially taken by this lemon tree, across the street. I was thrilled by it! Lemons... on a TREE? NO! Really? I mean... I know that lemons grow on a tree, at least I think I did. So, why am I so amazed? I guess it's no more amazing than salmon on a river beach, which of course, we have none this year! I just went out for a walk with the dogs and Bill and man oh man have things changed. Right before you round the corner to our house, via the river, there is now only one channel to float through, to make it downriver. Yikes! If you take the normal route, you'll end up on the rocks! Be careful! Dad took me so many places that were so beautiful! Have you ever seen the Marriott Springs Hotel? Now, that is the place to stay! That is, if you have the high dollar it takes to stay there! Whoo hoo! It has a man made lake, and if you want to go out to dinner you just hop a boat to one in five places to eat! How fun! How beautiful! Very Disney like! I'm so sorry about the weather station, but it is up and running again. I have added a link to the data/marine page of printable fishing regs. Kevinsdriftboat posted it and Freespool brought it to our attention. Thanks, Barney and Mitch! They are so awesome and do so much for our fisheries. They both bring so much information to the people, here. Cheers! I'm off to catch up on a bit of past reading and also to do some bookwork. Next I have to tell you about the awesome sermon I heard in Palm Springs. Fred Donaldson, the head pastor was just so good! Their church site is here. I wish I could get a copy and I wish I could share it all with every one of you! It rated up there in the top sermons I've ever heard! I'll save that for later this week, though. For now, I have to get to work! 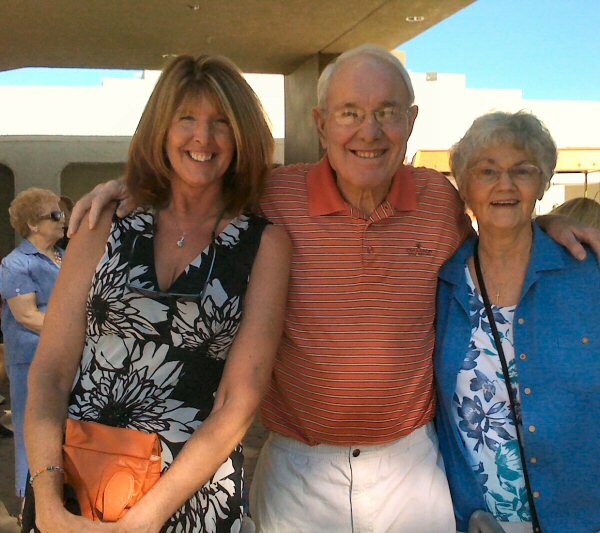 When I first flew into Palm Springs, I was picked up by Dad's neighbor, Bobby. He's a great guy. All of his neighbors are! He showed me Dad's car keys and the house, and left, offering me assistance for whatever I needed. "The Canadians" as Dad refers to them, are just grand. They make up a great group of people Dad lives near. They care for each other and watch over each other in the community where he lives. I took out my handy GPS, plugged in the address for Dad's rehab center and set out. I found it so easily. I love my GPS! I have often leaned over in the car, and thanked it, personally and vocally! Such a nice and helpful lady in that box! Dad! I was so glad to see him! He was badly beaten up! Railroad track staples all the way down his shin, a cracked hip and a hyper extended ankle! Oh, my, Dad! But, with his never ending spirit, he led me down a hallway and sat me down at the piano. Memories flooded back to me. When I used to feel badly as a young teenager, my Mother would suggest that I go play at a local nursing home. Guaranteeing me as I walked out the door of my home, that I would feel much better, afterward. Well, I still feel good, this time! The joy has lasted a long, long time! I sat down, having not played in months and stumbled around the keys, trying to pick out my Dad's favorite tunes. My fingers are amazing! I couldn't believe that after all these months, my fingers would still remember which keys to hit! Of course my technique was a bit weak and shaky. But, if I could only have confidence in them, that my fingers always remember, I would not ever make mistakes! They are God's fingers, and not mine! I really believe that! It's when I stop and gaze at my fingers and wonder how the heck they do that,-- that's when I make a mistake! My fingers have a gift that is none of my making. That is why when people compliment me on my playing that I say, "I know!" I say that with not one drop of conceit. I am simply amazed, also! Those fingers just do their thing and I often get lost in amazement as they play. They are not mine. I played "What are you doing, the rest of your life?" What a beautiful piece by Michelle LeGrande! Oh! Here it is! I recorded this last year, I think... on a small digital recorder and I was shaky technically then, also! Someday I have to keep playing and work on that technique again! At the last note, I looked up... and my Dad was crying! I nearly did, too! My Dad was so proud! You know, it occurred to me that at that time, right now in my life, my kids are having a difficult time. They are struggling and growing and pride is a valuable moment. It hurts to grow! Both for them, and for me! How precious it must be for my Dad to reach an age where your children have settled and they make him totally and fully proud. It is hard won! Don't get me wrong. My kids are great, and I am proud of so many things about them, but my Dad-- Well? It just showed... His head was bowed as he wiped a tear from his cheek. all those tough teenage years and scary young adult years that we have put him through! And yet, now, he was thoroughly proud of me! I felt the most amazing honor and I still feel it, now! It makes me cry! There were a few people in the room left over from eating their lunch and my music began to grab their attention. I could tell by looking that they were tapping their feet, or moving their bodies to the music, and that I was reaching them in a way that can only be done through music. :) It kept me going! One very kind woman wheeled her chair up beside me, and began to sing in the most beautiful contralto voice. A deep, beautiful and soulful melody rang out of that fragile body! Several times in between songs, she wiped tears from her cheek. I needed to know more about this beautiful voice, and what this woman's past was! What was it that lived deep in her soul that the music I played awoke in her? She didn't speak clearly, and her sentences were difficult to make out. Her singing voice, however, was clearly professional and I had an idea that she might have been well known somewhere, somehow, in her past. Her name was Kitty White, but she was born Kitty Bilbrew. I found out that she was in Rock Hudson films and spent her young years singing for Elvis and cutting several albums, along with being in Elvis films, too! Intrigued by her, I went home and searched her on the internet. Sure enough, here she is! Isn't she beautiful? 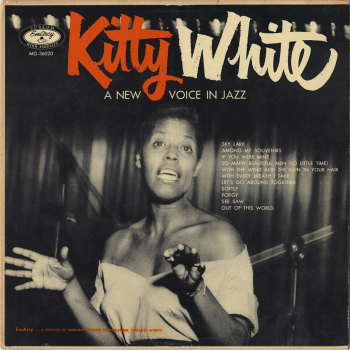 Click to read about Kitty White! I'm going to buy my Dad a copy of her CD if I can find it! I want one, too! The next day, I took with me some of the articles that I had found and read them to her, beside her wheelchair. Try explaining "the internet" to someone who has never experienced it! She kept asking me what paper this had been in! As I read to her, I could see deep in her eyes, her past coming back to her. It was so extremely touching! I came back every day to play for my Dad and for Kitty White and for all the other people I didn't have the honor to meet. Kitty's sister was also living there as a permanent resident and we learned yet more about their amazing history. But, it's not over yet! There's more! One of my most memorable moments was when a beautiful lady came up to me with a shy smile. She very timidly told me that she had been a pianist all of her life, after complimenting me on my music. I noticed that she had probably suffered a stroke, as her right hand was set awkwardly and stiffly to her chest. She was a bit quiet in speaking to me, but she was clearly moved by the music. After the first day, she wheeled up to me in her chair and suggested that she play the left hand, and I play the right. I agreed, telling her I didn't know how good I'd be at that after so many years, but that I'd try! She said she would try, too and we laughed together. She began with the most awesome, practiced, but obviously weak and a bit shaky boogie woogie in that still working left hand. I began with a scant right hand blues scale, matching her rhythmic bass. There is something that just sometimes happens musically that is a relationship like no other. Something unexplainable, and it happened, right there! We were lost, together, in a simple l, lV, V duet! I ended it with a gleeful glissando down the entire keyboard, and she bowed her head. The tears flowed and not just from her, but from me, too! All she could say was, "You have no idea..." Her words were choked out by emotion. She didn't raise her head until the moment passed, but when she did, you could see age being erased from her face like magic! I am so blessed by my trip to Palm Springs! It was a time with my Dad that I'll cherish forever! I am so happy... so proud... so richly, awesomely blessed. If playing the piano is giving, it IS much more valuable to give, than to receive! In giving, in sharing my music, I have received so much more in return! When I stood up from the piano and the small crowd clapped, I bowed just like I used to after playing a concert and said, "Thank you." I have never meant those words more, in my life. My Mother was right, as usual. Rocks are a girl's best friend! Indeed! It may not be prime fishing out there on the North Coast, but it's really prime agate hunting after that last high water! If agate hunting is your thing, come on down to a local river and try your luck! Funny how the agates I find any particular day most often match the color of the sky. I think it's that way because the hue of the sky brings out that color in the agates, and makes them the easiest to see. Today was a blue sky day, and the agates I found most were purple and opaque. So beautiful! 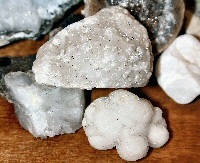 My absolute favorites are white bumpy rocks that sparkle! They almost always have little round bumps all over the sparkly spot. Just like diamonds, but better! I don't know what that is, but that formation causes the most incredible sparkles! Here are some! The one on the very bottom is my all time favorite rock. I keep it hidden and more watched after than my diamonds. They mean so much to me! Rocks are a girls best friend, you know. I sure miss the sight of fish, though. I stand, studying the normal spots for ages, thinking, "Is my vision bad? Are they there, and I just can't see them, or?" I switch to my prescription Polaroid. Nope! I just don't think they are there. Or many of them, at least. It makes for a grouchy household around here, when the fish aren't around. Pretty soon he came back in. "Jennie... Jennie... " He called and I tried my very best to stick up my nose. Oh, he made me mad! "I found a rock you'll like, Jennie!" No! I can't look! Nooooooo! But, I was caving, bigtime. If he had perfume, roses, anything else, I could hold my ground, but rocks? Oh, no! Help! I finally blurted out, "Do you think, that a silly rock will get you out of this mess?" I tried to sound strict and serious. "Yes." He answered humbly and sincerely. He really was trying! I turned to him and took the offering. Oh, still my soul, but he had the most beautiful rock! A smile began to take over my grimace. Just at the corners at first, but as it won over, I had to turn around, so he wouldn't see. I pretended to study it, but my smile was so big that he could see it, from behind me! It was no use. He saw me! He saw me smile! I had no choice but to turn to him and openly smile and admit defeat! "You win!" I turned to him, gave him a kiss on the lips and let the smile take over. I gave him a big hug, still studying the rock in my hands. I was free! My anger totally dissipated as I ran to the bathroom light, giddy and excited to see what the sparkles would do! Oh, my! Behold the magic! It was the most absolutely awesome rock, to date! So, boys, next time your girlfriend is mad at you, give them a sparkly rock. I hear they are a girl's best friend. Good morning! And it's off to Portland today to help Andrew with his medical appointments. He's back to check out the growth of his aorta. I bet if I didn't make the appointment for him and take him, he just wouldn't go. That really worries me! I can't just let him take the kind of consequence that kind of attitude might bring about. You know? Wake up, Andrew! I mean that, most sincerely! He was supposed to go back in three months and it's been more than that, by far. Time to go, Roo! So, today it's his echocardiogram and tomorrow, a meeting with our dear Dr. Menashe. He's wonderful! Please say a prayer for Andrew! Hello to a bright sunny day! It is supposed to be happy and therefore, I am insisting it is! Despite all odds! The tiniest bit of morning fog hangs over the hills that surround this little house, way down here. I feel so small. The trees tower down on me! The wall of trees that make up the hillside are a '70's shade of maroon. I've never been crazy about that color until today. My bathroom is this color and now I know just what to do! I'm going to get some forest green towels! Thank you, nature! You are the perfect home design team! When oh when will I rid myself of that cold, helpless and awful winter feeling of being stuck in my wheelchair on the door jam? It was a day just like today. Freezing cold! Brrr! The sun was out and my legs didn't work. They were constantly freezing. It was right after my aortic surgery and before the stents were put in to enable blood flow to my legs. I wanted with all of my heart (no pun intended!) to feel the sunshine on my legs, and no one was home to help me! I wheeled myself partially outside when I got myself stuck on the darn door jam with the door wide open! A thick rug on the out of doors stopped me short. I couldn't move! I still don't like that rug, either! The electric heater screamed with the cold air from the open door and I felt so helpless! I was helpless! It was an awful feeling and I can't get rid of it. Today when I woke up, I looked outside and the sky was that same cold and powdery blue. For the life of me, that color of sky haunts me, forever more. If there is anyone who knows how to get rid of that memory, let me know! Hypnosis? I want to enjoy my blue sky days in winter, again! The cold, steelhead river days that used to excite me! I want that back! That is what these days used to mean to me. Yes. I really want that back. Now these days scare me. The sight of them still, four years later, sends chills through my spine. That's not the way it's supposed to be. The doctor confirmed that it is indeed time for Andrew to have surgery. I feel so badly for the guy. He's been through so much and every time he gets back on his feet something challenges him, once more. It's not going to help my winter blues very much, either! I'm going to be going through the same thing in the same season, except I'll be on the care side of things. I am counting on the fact that Andrew's healing will heal my nightmare of cold. Just when I was losing all hope, a wonderful friend of mine, Joëlle Robinson sent me some. I love you, Joëlle! Thank you so much! This just lifted my heart up in praise! Praise.. and HOPE. I'm going for a walk, now, and I will carry this in my heart. The chipmunks chase each other in a flurry of love and play. Bright and brilliant green valley in a dry and seemingly stoic ring of mountains, and there is hope. We are filled with peace at the simplicity and goodness of it. Clarks nutcracker sings melody, rosy finches share their joy. May I decorate for Christmas, NOW? It's time to count our many, many blessings and be with our families. 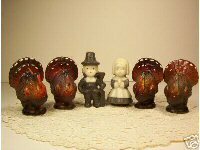 I wish you the most joyous Thanksgiving and God Bless you all! We need more votes! Vote on your favorite Kwikfish, here! Down with the Thanksgiving candles and up with the Christmas decorations, already! Truth be told, I cheated. I really did and I needed to, and I'm glad I did it! I put up some garlands on the upstairs deck, all pre lit with pretty colored lights. Then, I wrapped a wreath in red bulbs and put it in the center. It's so pretty! I can't wait to get out the rest of the garb! I need a mood boost, and badly. Christmas lights will come in handy for this! I want Andrew to be charmed by it all. I'm so afraid that like myself, whatever is around him during this difficult time will bring bad memories. Will Christmas lights forever haunt him like blue winter skies do me? I had a great time in Portland with my family. I am blessed. At the same time, I was rather homesick there. Sometimes I wished my home were nearer to my family. If I'm over there, I miss my dog, my river, and my family here. If I'm here, I miss my friends, and my base family! When I arrived home, yesterday, Bill was buried in preparations of a second Thanksgiving dinner. It was so delicious! He tried out Thumpers Turkey-on-the-Traeger recipe and oh, was it good! Thank you, Thumper! Andrew is in deep thought and worry over where to have surgery. Here, where his friends and family are, or at Stanford in California? Regardless of where, if it weren't so disastrous, I almost think dissecting is easier. That way, you have no choices to make! Of course I'm kidding, but God granted me the ease of putting me into shock and having the ambulance take me direct to the hospital. I had no decisions to make. Yes, I was near death, but can you imagine being 21 and signing up to have your chest opened, please and thank you? Not I! When I got home yesterday, I was so tired. "So Tired" is becoming my signature phrase. I'm sure the moderators are sick to death of hearing that I'm tired, but I just am. I feel so overwhelmed, lately. I must change my attitude! I don't want to be someone who is depressing to be around! That just doesn't seem like me! The goal in Life's Journey is not to arrive at the grave safely in a well preserved body, but rather to skid in sideways, totally worn out, shouting, "Holy Moly what a ride!" Uh oh! The "totally worn out" part is here already, and I'm not at all ready to skid in sideways! The call of the river was strong as I gazed out my window while unpacking, so I slipped on my Tillamook boots and rain garb, gathered the dogs and headed out to see what there was to see. The river is low and clear and there are so many changes. At two points, now, I can walk out on the rocks in the middle of the river. I can see things I couldn't, before! New channels and fish hiding by rocks! I also found a huge crystal agate! Actually, I had to break a big rock in two to find the sparklies but it enchanted me when I did! The river's edge at the logging bridge is cluttered with chum carcasses, but here, there are none. None! Not one! Very odd! In the next two days I need to prepare for the Christmas party. I need someone to sit at the front desk as a greeter. I'll put a notice, here. Guess how many toys, here! 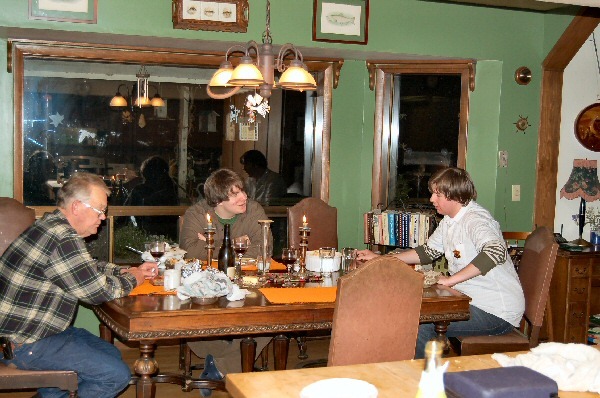 On Thanksgiving, we all met at my cousin Evie Fuson's home. What a beautiful home and what great food we had! After, I went to stay downtown. The next day, all of the females of the family met to go shopping, like we always do. We had lunch together at a little Italian place where we reserve the wine room. 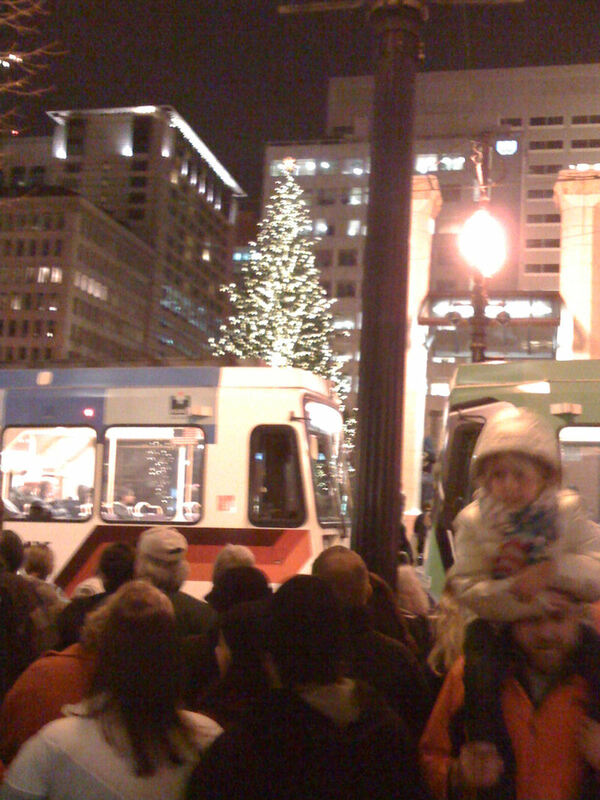 In the evening, my friend Tammy came over and we walked over to watch the Christmas Tree lighting. What chaos! We couldn't find anywhere to stand! We finally situated ourselves across the street from Pioneer Courthouse Square and began the countdown! It was so exciting! Max drove up and totally blocked our view!